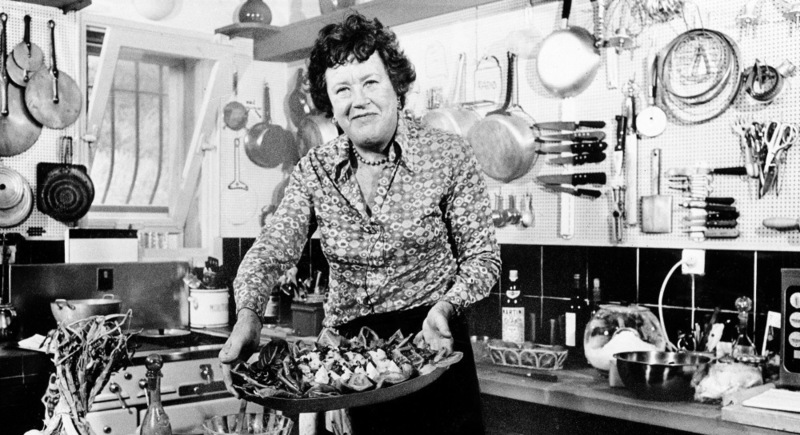 Julia Child On France, Fat And Food On The Floor In a 1989 interview, Julia Child describes the first meal she had in France in 1948 — the start of her lifelong love affair with French cooking. With her signature combination of gusto and charm, Child would spend the rest of her career guiding American amateurs through the intricacies of French cuisine. Bon Appetit: Chef Julia Child shows off a salade nicoise she prepared in the kitchen of her vacation home in southern France, in August 1978. Child remembered the first French dinner she had, back in 1948: sole with mushroom and white wine sauce, and oysters on the half shell. "I just couldn't get over it," she told Terry Gross. "I hadn't ever had that kind of food." This interview was originally broadcast on Nov. 14, 1989. 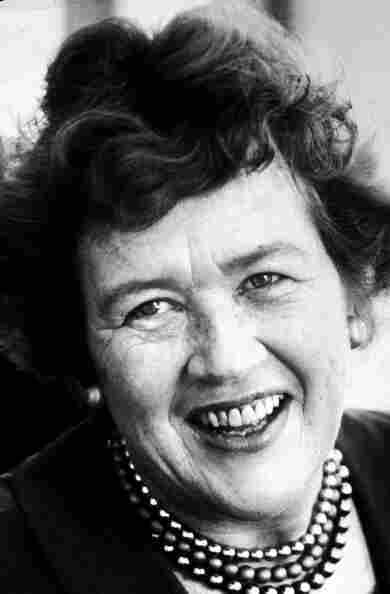 In a 1989 Fresh Air interview, Julia Child recalls being hooked on French cooking from the very first bite. She made her passion her life, and spent the rest of her career guiding American amateurs through the intricacies of French cuisine. Originally from Pasadena, Calif., Child was in her 30s when she arrived in Paris with her husband, a U.S. diplomat. She signed up for a course at the Cordon Bleu cooking school in Paris. Eventually, it was Child herself who was teaching cooking classes, along with Simone Beck and Louisette Bertholle. The trio would go on to collaborate on the landmark two-volume book, Mastering the Art of French Cooking. "I found that the recipes in most — in all — the books I had were really not adequate," she told Terry Gross. "They didn't tell you enough. ... I won't do anything unless I'm told why I'm doing it. So I felt that we needed fuller explanations so that if you followed one of those recipes, it should turn out exactly right. My feeling is that once you know everything and have digested it, then it becomes part of you." Child would go on to host eight television cooking series, including the Emmy Award-winning The French Chef, which appeared on more than 100 public television stations in the U.S. She died in 2004 at the age of 91. Child, who made French cuisine feel accessible to Americans, died in August 2004 at age 91. "In the 1960s, you could eat anything you wanted, and of course, people were smoking cigarettes and all kinds of things, and there was no talk about fat and anything like that, and butter and cream were rife. Those were lovely days for gastronomy, I must say. "In those days, too, it was classical French cooking, and you didn't deviate from the rules. Then shortly after that ... in the 1970s we got nouvelle cuisine, in which a lot of the old rules were kicked over. And then we had cuisine minceur, which people mixed up with nouvelle cuisine but was actually fancy diet cooking. "Then we went into the organic phase, where we had bean sprouts and tofu to a large extent. And now we're in kind of a fright situation, where people are very much afraid of fats and oils, and cholesterol has reared its ugly head." "I remember my first meal there. We had come over on the boat because that was in 1948, and airplane traffic was not rampant, or it hardly existed. And we had our big, old, blue Buick on the boat and drove from La Havre to Rouen, and I remember my first French meal. It was just delicious. "Of course we had wine, which I had not known much about, and oysters on the half shell, and then a beautiful dish of sole in white wine sauce with mushrooms, and I just couldn't get over it. I hadn't ever had that kind of food." Who Says French Food Can't Be Friendly? "Well, one time, I was cooking — blanching some broccoli, and it was in a salad basket, which was lowered into a big kettle, and when I picked it up, my fork slipped, and it all fell on the floor. ... We did stop [taping] because it was a real mess. But every time we stopped, it would cost several hundred dollars because it always took half an hour to get back [on track] again, and you have to pay overtime. "Another time, there was a short circuit on my microphone, and every time I touched the stove, the microphone would go bzzzzzzzzz and I'd clutch my breast." On being "alone in the kitchen"
"People would say, 'Well, I saw you drop that chicken on the floor,' which of course I never did. All I did was flip a potato pancake into the stove, and then I put it back into the pan, and I said: 'Well, if you're all alone in the kitchen, nobody will know.' "